This article details the results of the most recent SWPP quarterly survey on critical workforce planning topics. In this survey, which focused on job qualifications for workforce management professionals, approximately 165 call center professionals representing a wide variety of industries participated and provided insight into numerous workforce planning questions. The largest percentage (56%) of the participants was from large call center operations with over 500 seats, followed by 12% with 100-200 agents. However, 10% of the survey participants represent centers with 100 or fewer agents. All types of call center operations were represented in the study, with the biggest percentage representing financial, insurance, and telecommunications. The survey participants were asked to identify the qualifications that are required or desired when recruiting a new team member for the WFM group that will be in the forecasting role. Respondents were able to pick all that apply and choose between Required, Desired, and Not Required or Desired. In terms of education, nearly all require a high school diploma while about a quarter required a bachelor’s degree. Most of those that do not require the bachelor’s degree have it on the desired list. 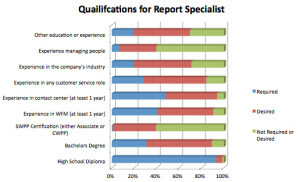 The other qualifications with the highest level of requirement are experience in the contact center and in WFM. While the SWPP certification is required by only a few, it is desired by a growing number of centers. 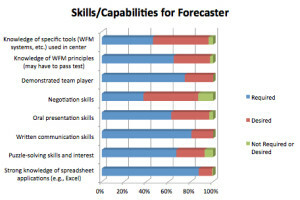 When asked to identifiy the skills/capabilities required for the Forecaster, the items gaining the highest number of Required responses are strong knowledge of spreadsheet applications, written communication skills, and demonstrated team player. In addition, over 50% expect knowledge of WFM principles, oral presentation skills, and puzzle-solving skills and interest. Very few of the potential qualifications on the list were neither required or desired. 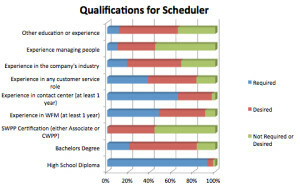 When recruiting for a new Scheduler, the education requirements are a bit less stringent than for Forecasters with a very high percentage requiring the high school diploma, but somewhat fewer requiring the bachelor’s degree. 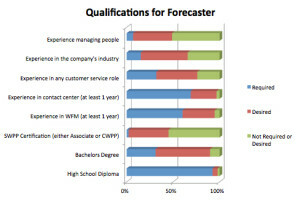 Once again, experience in the contact center is very high on the list with experience in WFM highly desirable but not required as frequently as for Forecasters. In both cases, experience in the company’s industry and in any customer service role is highly desirable. 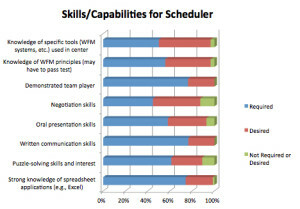 When asked to identify the skills/capabilities for the Scheduler, the responses are remarkably similar to those requested of the Forecaster. There is a slight reduction in the need for strong knowledge of spreadsheet applications and knowledge of WFM principles, but they are overall very similar. 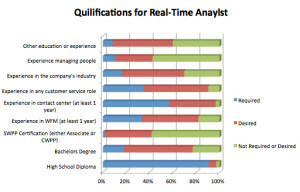 It is interesting to see that the respondents look for similar qualifications for Real-Time Analysts and Schedulers. Given the common career progression in many WFM departments, looking for the appropriate qualifications to move up to the next role is reasonable. 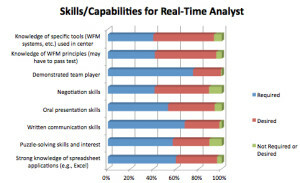 Skills/Capabilities for the Real-Time Analyst track with the other WFM professionals with a somewhat reduced requirement for spreadsheet knowledge. Recruiting for a report specialist has similar educational expectations as the other WFM professionals. However, experience in contact centers, customer service, and even the customer’s industry are less important. 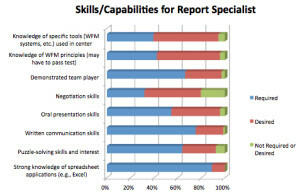 Report Specialists have a higher requirement for strong knowledge of spreadsheet applications than most of the other WFM professionals, but other requirements and desirables are similar. 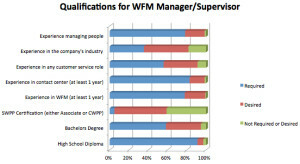 When recruiting a manager or supervisor for the WFM team, the bachelor’s degree is required by more than half and desired by most of the rest. However, the most significant differences from the other team members are the requirements for experience in contact centers, managing people, and in WFM (all over 70%). 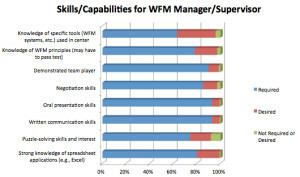 When it comes to the skills/capabilities needed for the WFM Manager/Supervisor, nearly every item is required at a high level with more than 60% choosing Required and almost all of the rest choosing Desired. Negotiating skills and oral presentation skills are required in over 80% of the responses versus the 50% or less in all of the other roles. Even knowledge of the specific tools used in the center is required in 60% of the cases, which is well above the requirement in the other positions (although nearly all respondents put it in the Desired category if not Required for all roles). Today’s workforce management professional is an educated, multi-talented individual. While the initial requirements for hiring may vary some among the various roles in the WFM team, they are quite similar. This can support a strong career progression and back-up plan within the team as well. Clearly, the WFM professional of today is a key player in the success of the contact center and indeed the organization as a whole, and brings a wealth of knowledge and skills to the role. We hope you will participate in the Winter survey, which is in this newsletter and will be available on our website soon.